Every Christmas Season, our family has an advent calendar that we open each day in the lead up to Christmas. 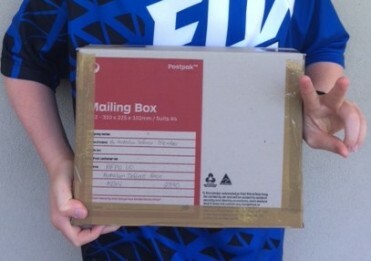 We started it when the kids were small to help us in our focus on Jesus in this busy commercialised season. Over the years, we have added various other advent calendars – chocolate, lego creating, stickers, Jesse Tree, reading a Christmas book each day etc. This year, we decided that we would forgo the chocolate advent calendar and make up an ‘acts of kindness’ calendar instead. I have attached a pdf copy which you are welcome to adjust to suit your family. 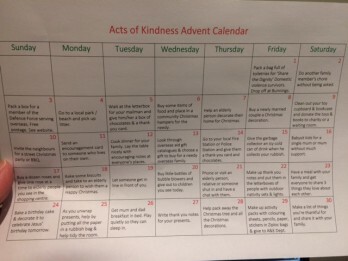 Please just click on this link – Acts of Kindness Advent Calendar to print off a copy. Since we home educate, we have the flexibility throughout the day to go to the shops as well. In fact, this last week, we started our acts of kindness advent calendar early and spent Tuesday morning at the shops. 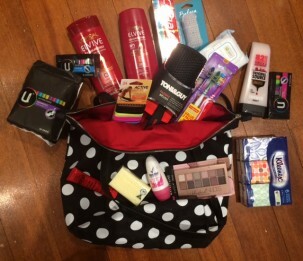 We bought a bag and filled it with toiletries which we then gave to the “Share the Dignity” organisation (www.sharethedignity.com.au/christmas-charity) who are distributing them to victims of domestic violence this Christmas. You can drop in filled bags to any Bunnings store or select hairdressers/ beauty salons up until this Saturday. This particularly suited Princess (14) who spends a lot of time scouring the toiletry aisle in the supermarket. My aim is to be more others focused and Jesus focused in this lead up to Christmas. Thus, we have printed off the Acts of Kindness Advent Calendar and are looking forward each day to focusing on how we can help others.